The legendary Dolomites are part of the Southern Alps and some of the most depicted mountains ever. Due to their special (dolomite) rock they are pale in color and bizarrely shaped. The highest mountain and only glacier is the Marmolada with 3,342 meters. The original Ladin population has been largely displaced by the Bavarians and Italians. In the province of Bolzano (formerly South Tyrol) the centuries long influence of Austria can be felt significantly while Trento and Belluno were predominantly under Italian influence. 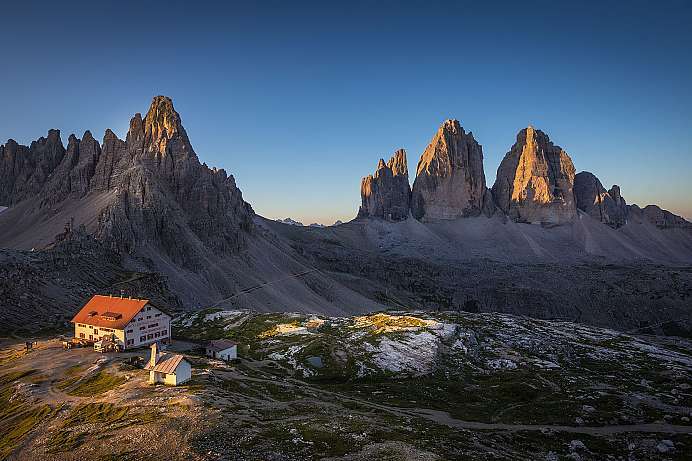 An abundance of trails and huts opens up the Dolomites to hikers. If possible, you should avoid the main holiday periods. The world-renowned center for mountain-sports is located in the Valle de Boite in the Ampezzo Alps. 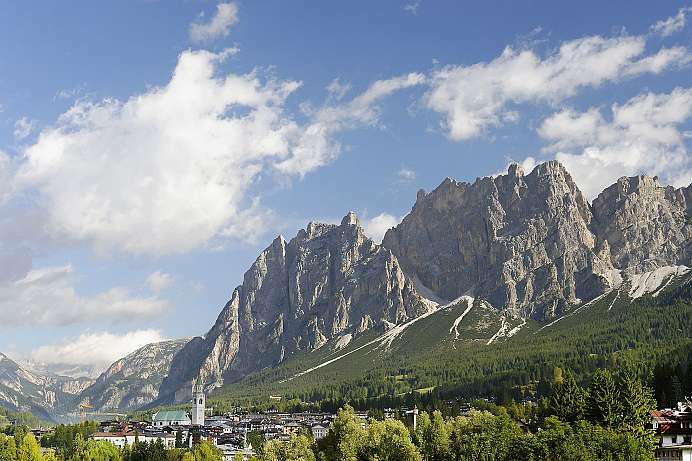 Cortina is surrounded by the most beautiful peaks of the Dolomites: the Tofana di Mezzo (3,244 m), the Monte Cristallo (3,221 m) and the Sorapis (3,205 m). In most cases mountain railways lead to the summit. Until the middle of the 20th century, the spoken language was mainly Ladin. Since then Italian has taken over. Local cuisine and expressions are still greatly influenced by the old Austrian Empire. Gulasch and Krapfen (donuts), Gröstl and Chenedi (Tyrolean dumplings) reflect the long association with Tirol. Polenta and bean soup on the other hand originate from the Venetian plain. 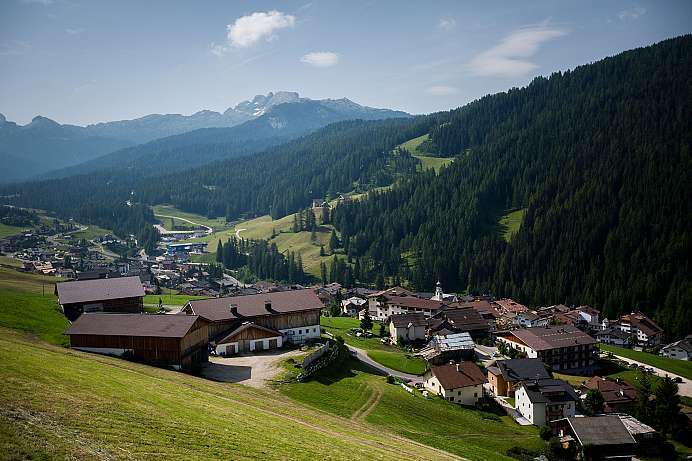 San Cassiano sits on 1,537 meters between the peaks of Fanes and the extensive Pralongià Meadows, which in winter form the center of the ski resort of Alta Badia. The imposing rock faces of Lavarella, Conturines and Lagazuoi tower above the village. In summer you can see many climbers in the rugged Dolomite walls. Hikers will find trails of varying length and difficulty. A cablecar takes visitors from the village to the Pralongià Meadows where one can enjoy the sun and nature. The church built in 1782 is dedicated to San Cassiano, whose martyrdom is displayed on the main altar. This striking massif in the Sexten Dolomites has become the most famous landmark in the Dolomites. At 2,999 meters, the “Big Peak” was first climbed in 1869. Even today, the peaks are still very popular among climbers. The easiest objective to reach is the Auronzo hut, the Rifugio Auronzo (2,320 m), directly south of the massif on the Forcella di Longeres, which can be reached by cable car from the vacation town of Misurina.